We would like to introduce you to our project Smart Break out EA. We all waited long for this fresh version, but it is finally here available for all of You. We had to make sure all works perfect and also made big tests for this EA. This version has been tested on live account for about 4 months and still running. During this time EA was constantly updated with new features which made this product very stable and profitable at all market conditions. Check the live account history statement. The initial deposit for this live account was 22,68$, after 4 months of stable every day run, EA gained about 450$, which means it is ~1900% of profit. During the live test EA was running every day and has been pushed to the limits to test it on all market conditions. EA was constantly upgraded until the stable release has been reached, which is now available for you! Test was performed on live account using our partners PaxForex broker. How does break out ea works? The main reason of why this BreakOut Hedge EA is so stable and safe is its Hedging system. After you load this software on your chart Hedge EA immediately finds the last important Support and Resistance levels and puts pending orders at those levels. Have your ever had a problem to decide in which side the market will go? Will it bounce from the support line or hit the resistance lines? This is is the problem which every Forex trader faces every day… Well, lets be smart and put the price line in the middle! EA will keep refreshing new support and resistant levels on every new bar, so you always have latest levels loaded with pending orders on them. Now, if the market breaks out to one way or another (remember we dont care which side because we have both BUY and SELL pending orders at the same time) price hits one of those levels and trade has been opened to that side. This EA is also equipped with smart trailing stop system, which captures even the smallest profits market gives you. What if price turns around and goes the opposite way? This is where the Hedge protection comes in. Hedge EA always sets the opposite pending order which will be taken if the market turns around, and this cycle will be repeated until the market decides its trend. You maybe asking what if EA opens much more for ex. BUY trades than SELL, like 9 versus 2 orders? This way you would have big loss if market keeps turning around. But this is where our latest feature becomes handy, it is called “HedgeRatio”, if you put 3 at that field, EA will never let the difference to be bigger than 3 trades in between, like for ex. : it will only open max. x3 Buy versus x0 Sell, x4 Buy vs x1 Sell, 13 Buy vs 10 Sell and so on. This way you dont have too big difference ratio between two sides, and eventually one or another wins. It is only the question of time! We know, at first glance it might be confusing and the mathematics could be difficult to understand. But that is why we worked so hard to made this all automated and coded very stable and universal algorithms in the the EA’s engine. You will be also provided with .pdf manual guide with detailed explanation of every parameter in settings window and instructions how to use the EA. Once you installed the EA you can use it straight away with default settings. With this new Hedge EA release we have also developed new innovative and detailed information display, which will appear on your chart and will keep you informed with every process which Hedge EA is doing. Also the display will print out all the calculations and will keep track of every trade made in the trading cycle. Any error or notification will pop out if something happens! Thats very handy to have when you want to have full control of the trading process. 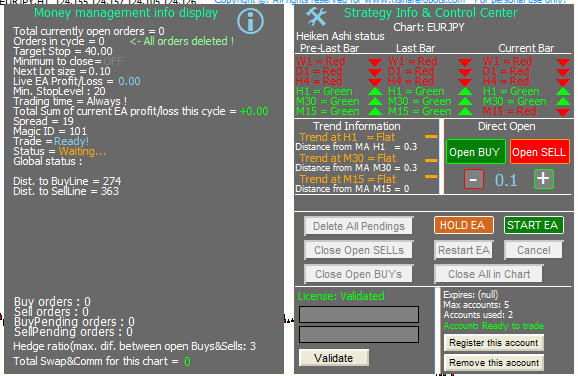 Also you will be able to use new user interface which will allow you to control your trades with single clicks! Every version of our software is able to trade with any time frame and any currencies pair as well as stocks, metals etc.. All our EA’s can even trade multiple pairs at the same time separated by magic number. The software has special memory system which creates memory files and logs the trading process, so you never lose your trading cycle in case of platform crash or any connection problems. Start earning profit at the professional level with this exclusive Hedge EA. Get your own copy of: Smart BreakOut + Hedge trading EA. You can use EA with default settings already loaded for you. Very big update for this EA. It comes with completely new user interface which allows users to control trading process even more easily with just single button clicks. You can close, open and manage your trades directly from the chart now. Also there is a new window with special trend calculations for each time-frame so it is easier to make decision on settings or get common sense about the pair trend. From now on it is possible to rent the EA for various period of time (pay as much as you use it). You can add or remove accounts to your license. Installation process is very easy as well, setup file will be provided. Many safety bugs has been also fixed, so EA is even more safer now. Start earning profit at the professional level with this exclusive Hedge EA. Get your own copy of: Smart Break Out EA. You can use EA with default settings already loaded for you.